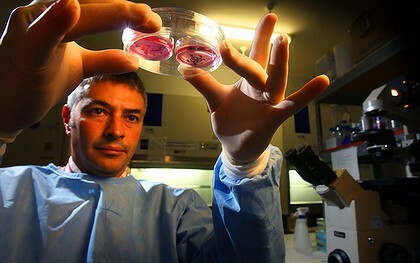 AUSTRALIAN scientists are trying to clone hair by using stem cells in research that could lead to a cure for baldness. All other treatments for hair-loss have problems. Hair transplant surgery redistributes hair but does not create new hair. Drugs such as minoxidil and finasteride stop balding as long as they are taken but can’t reverse it. And treatments such as Shane Warne’s “Yeah, yeah” hair involve hairpieces. Scientists from St Vincent’s Hospital in Melbourne and Melbourne University, led by the hospital’s dermatology director, Rod Sinclair, have extracted adult stem cells from hair follicles and are trying to coax them to spawn new hair follicles in a culture dish. “We’ve now got three stem cell scientists in our department working on hair follicle stem cells,” Professor Sinclair said. Just as the body rejects other transplanted organs, so it rejects transplanted hair - a full hair, including its follicle, is an organ in itself. Ideally, that sheet of cells should “aggregate to form new balls [so] you can take out those balls and reimplant them to form new hairs.” But the sheet of cells was producing one ball instead of many, he said. The other challenge is implanting the baby hair follicles. "You have to put the stem cells in a scaffold, insert the scaffold into the skin, the scaffold makes the hair follicle grow in the right orientation and direction, and then disintegrates. “Growing a hair is not enough. You want one that grows in the right direction with the right colour and curl and wave so that it looks natural.” Professor Sinclair’s group is one of several research bodies investigating hair cloning. The British group Intercytex reported last June that trials in humans had proved promising, with some of the subjects regrowing hair. “What Intercytex are doing is very similar to what we’re doing, but I think they have a lot of problems trying to get the cells to reaggregate,” Professor Sinclair said. Other research is focused on trying to reinvigorate follicles that shrink on top of the head and cause baldness in the first place. Scientists are also trying to pin down the genes that cause baldness. They say it doesn’t work. They can multiply just by 1. So it doesn’t work. Then what is the purpose of the animal trials? I don’t get it. Besides, they are not using STEM CELLS, but just the good old DERMAL PAPILLA cells. » growing a hair is not enough. 10 years is the new “5 years” lol. I actually hope that Follica’s protocol works rather than true cloned HM. Really, all that cloned HM allows is to greatly enhance traditional HTs, which is to say, you’d still have to undergo an invasive, painful, bloody, and labor-intensive (and therefor, very expensive) procedure. Follica-like procedures are far more elegant, less invasive, and the results should be better than mega-session, HM-enhanced HTs. The fact that every company trying to clone follicles is using DP cells is a good sign. They’re all trying different variations of the same thing. They’re onto something, and sooner or later one of them will make it work. The company that gets there first will make obscene amounts of money; there is incentive to get it done quickly. » a good sign. They’re all trying different variations of the same thing. » They’re onto something, and sooner or later one of them will make it work. » is incentive to get it done quickly. I agree with you Clayshaw. » I agree with you (too) Clayshaw. in 2030 we will have this company in the market.